First published in November 2012, Craft Revival Trust. Budget allocations to the Handloom and Handicrafts sector have not matched their role in the economy. Despite employing approximately 3% of the total workforce, combined budget allocations to handloom and handicraft sector remains only 0.06% of total budget expenditures. In actual terms, while the total budget expenditure estimate for the year 2010-11 is eleven lakhs eight thousand seven hundred and forty nine crores(INR 11,08,749 crores), the combined budget allocation for handloom and handicraft is six hundred eighty eight crores(688.47 crores). The overall budget for the textile sector has been consistently increasing over the years but the total budget for handlooms reduced over its previous year allocations in six out of the last fourteen years. The budgetary allocations to the textile sector grew by over 650 percent, from Rs.739.04 Crores to Rs.5608.08 Crores during 1997-98 to 2009-10. However, the share of handlooms registered an increase of only a little above eighty percent(81.43%) over the same period, from Rs. 203.50 Crores to 369.22 Crores. In average terms this means in the last fourteen years since 1997, while budgetary allocation to the textile sector grew at an annual average rate of more than forty five percent , the annual average increment in handloom budget was less than six percent. 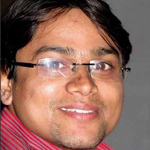 Budget allocations for handicrafts averaged less than 7% of the total textile budget over the last decade, but allocations have increased 463% over the same period..
Non-plan expenditure has been increasing faster than Plan expenditures, suggesting the lack of a long-term policy vision for the handicrafts sector. Part of the reason for this may be the lack of a logical fit of handicrafts within the textiles ministry. In the aftermath of economic reforms in India, there has been a policy shift in favour of organized sectors of the economy. Consequently, the budget allocations are also tilted in favour of the organized sector. 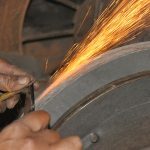 Given the continued ability of the largely unorganized handloom and handicraft sectors to generate employment, the government’s budget allocations to these sectors need to be proportionate to its actual employment figures and employment potential.Budget AnalysisThe handloom and handicraft sectors continue to be neglected in terms of budgetary allocations. Given that these two sectors directly employ more than ten million people which is approximately 3% of India’s workforce, the allocation to these sectors have not matched their role in the Indian economy. Both for handloom and handicraft , the budgetary expenditure share in the national expenditure budget in the year 2010-11 remained unchanged compared to last year, 0.03 and 0.02 percent respectively. In terms of percentage share of the total textile budget, the combined budget allocations for handloom and handicrafts reduced to less than 13 percent in 2010-11 from 35.16 percent in 1997-98.HandloomsAs evident in Table 1, the overall budget for the textile sector has been consistently increasing over the years but the total budget for handlooms reduced over its previous year allocations in six out of the last fourteen years. During these years, the share of handloom budget as a percentage of the overall textile budget reduced from 27.5% in 1997-98 to 6.6 % in 2010-11. The budgetary allocations to the textile sector grew by over 650 percent from Rs.739.04 Crores to Rs.5608.08 Crores during 1997-98 to 2009-10. However, the share of handlooms registered an increase of only 81 percent over the same period, from Rs. 203.50 Crores to 369.22Crores. 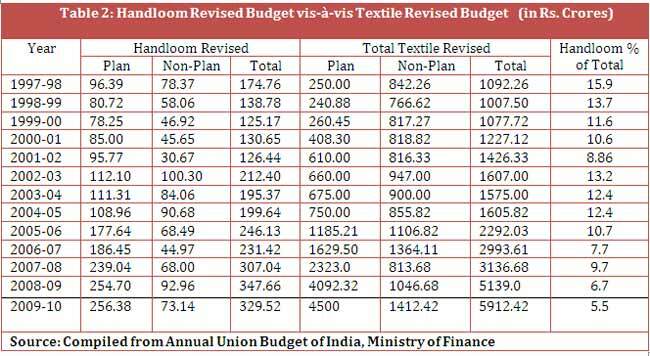 Even this small increase over the years in the handloom budget should not be attributed to any long- term growth plan. The biggest increase in the budgetary allocations from Rs. 152.83 Crores to 255.68 Crores (by 67.2%) was witnessed in the year 2003-04, which was also the year of the general elections in the country. Hence the reasons and the nature of allocations require more elaborate analysis. The general budget is usually announced in the beginning of the fiscal year and the provisions in the general budget are revised towards the end of the fiscal year based on actual expenditures. 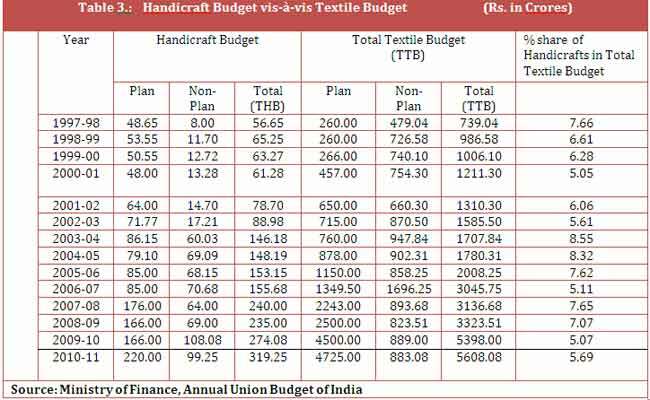 For handlooms, in most years, the revised budget has reduced the allocations to handlooms, resulting in being an even smaller portion of the total textile budget (see Table 2). 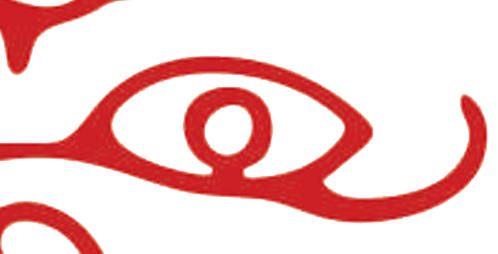 In fact, the Parliamentary Standing Committee on Labour (2004-05), in its sixth report, presented to Lok Sabha on 25 April 2005, commented on the under- utlisation of funds allocated for handloom sector and noted that Plan allocations of the Textile Ministry meant for implementation of various schemes remain underutilized year after year. The Committee was also not happy with the trend of Non-Plan expenditure of the Ministry. 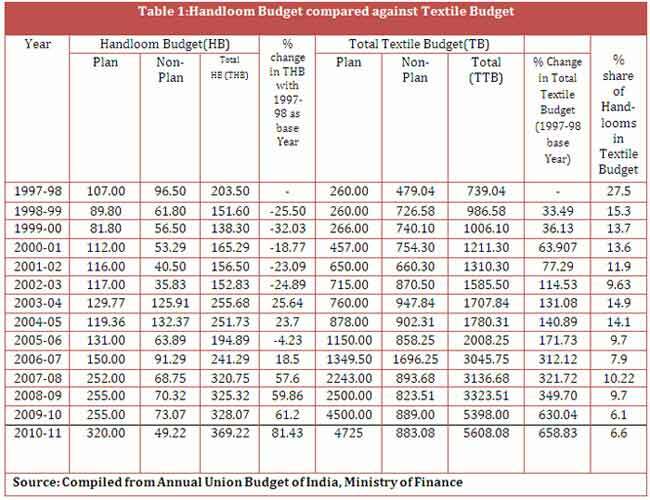 Budget allocations for handicrafts averaged less than 7% of the total textile budget over the last decade, but allocations have increased 463% over the same period (see Table 3), exhibiting better increment compared to handlooms but still far behind the overall increase in the total textile budget increment of over 650%. This increment in budgetary allocations to handicraft sector is perhaps the reflection of the government’s inclination to support export-oriented sectors. This highlights the fact that the government is more keen on promoting exports than protect employment and safeguard livelihoods of millions of skilled people in handloom sector. The export figure of handlooms in the India is less than half of the exports of handicraft sector. However, the non-plan expenditure has been increasing faster than Plan expenditures, suggesting the lack of a long-term policy vision for the handicrafts sector. The plan component of textile budget increased over the last fourteen years by more than eighteen hundred percent and the non-plan share increased by less than one hundred percent. But, the trend is conspicuously the reverse in case of handicraft. Table 3 reveals that over the years while plan allocation has increased by around three hundred and fifty two percent, the increase in the non-plan expenditure is more than eleven hundred percent. Since Plan outlays suggest longer term planning and direction in government investments for sectoral growth, the strategy of raising non-plan allocations suggests an ad-hoc approach toward this sector. Part of the reason for this may be the lack of a logical fit of handicrafts within the textiles ministry. In the aftermath of the economic reforms in India, there has been a policy shift in favour of organized sectors of the economy. Consequently, the budget allocations are also tilted in favour of the organized sector. The huge budgetary allocations in the textile budget under the schemes such TUFS and SITP are such examples .Given the continued ability of the largely unorganized handloom and handicraft sectors to generate employment, the government’s budget allocations to these sectors needs to be proportionate to its actual employment figures and employment potential. Despite adverse policy and market conditions, handloom and handicraft sectors continue to be a livelihood option for millions of artisans and weavers. The Government therefore, should ensure a level playing field for this sector and support capacity building efforts toward encouraging competition among the different sub-sectors of textile industry. Notes: This budgetary analysis note is based on the figures taken from the expenditure budget (volume II) of the various annual union Budgets of India. The expenditure provisions included in the various Statements are net of recoveries and receipts. Volume II of the expenditure budget gives details of allocations at disaggregated level within the Ministries. The figure for handloom and handicraft is provided under the ministry of textiles with major heads like Plan /non-plan and revenue/ capital expenditures. Expenditure figures are given for both the general budget and the revised budget. Non-Plan expenditure is a generic term, which is used to cover all expenditure of Government not included in the Plan. It may either be revenue expenditure or capital expenditure. Part of the expenditure is obligatory in nature e.g. interest payments, main subsidies, pensionary charges and statutory transfers to State and Union Territory Governments.